Island Peak (6,183 m.) also known as Imja Tse is one of the most frequently climbed peak among other peaks in Nepal and it is also one of the most sought peak by clients of Nature Adventure Trekking and Expedition. Island peak is located in the Everest region so, Island peak climbing normally combined with Everest base camp trekking which, gives sufficient time to acclimatize before making attempt to climb it.As this peak is in the Everest region, the Island peak climbing trip starts at Lukla and follows the trail of Everest base camp trekking. Somebody who are well acclimatized directly go to Chhukung then Island peak base camp and the next morning they climb it.But many those who are planning to climb Island peak as their first mountaineering attempt then first go to Everest base camp and Kalapattar and go down to Chhukung and then better to climb.While climbing, Island peak with Everest Base Camp trekking it requires 20/21 days trekking and peak climbing. This peak is said to have first ascended by the British team in 1950s in course of making summit on the highest peaks in the world, Mt. Everest. This peak is a part of Mt. Lhotse. It is risen up to the north of Nupse. Still those who are climbing Mt.Everest mostly in spring season they climb Island peak for warm up and for acclimatization purpose so in March April remains this peak crowded compare to Oct- Nov. Island peak was regarded as a trekking peak for its easyness to climb. Many climbing guides say this peak climbing doesnt require comprehensive mountaineering skill but since few years back, crak on the normal route to top of the Island peak has forced to change the trail to the summit so the new trail to summit has been more difficult than earlier route.Yet, this trekking peak is climbed by many adventure tourist each year. And those who don’t have previous mountaineering knowledge also climb this mountain but if you have basic knowledge that will be safer for climber and climbing guide. Our climbing guides provide basic mountaineering knowledge at Island peak base camp presenting the demo and putting you as team. 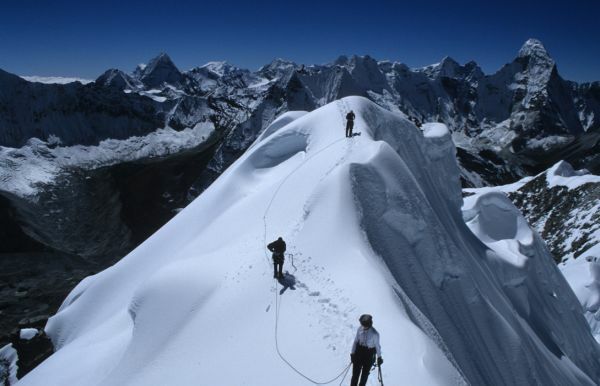 Which will provides basic safety ascending and descending in Island peak. Island peak is accessible in 2 camps from Dingboche. The first night you spend in Chhukun and next day you walk up to Island peak base camp. As there is not tea house at base camp of Island peak we provide tents, and all equipment for meal and accommodation. And from base camp up to high camp there is not much ice, and above high camp the real journey of climbing starts up to the top. And after successful climbing as client’s condition we arrange either to walk down to Chhukung or spend 1 night at Island peak base camp. If you got to the top late in the morning and you are over exhausted better to stay 1 night in base camp. For climbing Island peak you need moutaineering gears and if you didnt have bought anything then you can rent them in Chhkung. All mountaineering gears from Goretex to mountaineering boots,carribinar, jumar, ice axe and climbing belt is available on rental.But warm clothes is better to have your own.And also you require to get the peak climbing permit and garbage deposits before setting off to Island peak climbing and all the arrangement is done by Nature Adventure Treks what you need to do is let us know it a month earlier of your climbing. Island Peak (6,183 m.) also known as Imja Tse is one of the most demanded peaks among the clients of Nature Adventure Trekking and Expedition. This is one of the famous climbing peaks located in the Everest region. This peak is said to have first ascended by the British team in 1950s in course of making summit on the highest peaks in the world, Mt. Everest. This peak is a part of Mt. Lhotse. It is risen up to the north of Nupse. As the British team did, you can combine Island peak climbing package as well.The Island peak climbing usually begins with a flight from Kathmandu to Lukla and then continue journey through Namchhe, Dinboche, Chukung and after having excursion to the peak, you also extend the trip to Everest base camp and return back through classical route to Lukla and fly back to Kathmandu. Nature Adventure trekking and Expedition has organized many Island peak climbing so far. We have well trained mountain guides who have attended basic to advance mountaineering courses. We advice our clients to make sure that guide has taken the at least basic mountaineering course to climb the Island peak. 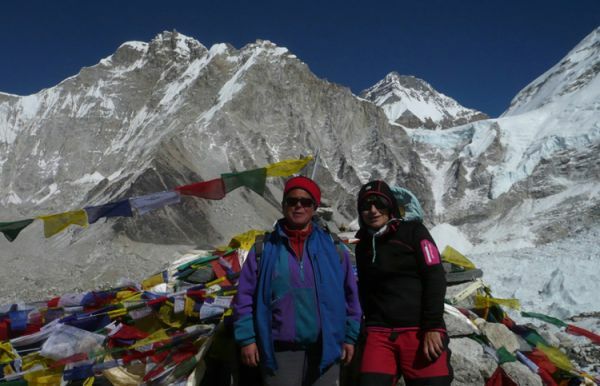 So make sure of, your successful climbing and for good arrangement of Everest Base Camp trekking and Island peak climbing just leave on Nature Adventure trekking, we make your adventure trip enjoyable and memorable with our professional team. Day 01Arrival in Kathmandu. And transfer to HotelArrival in Trivuwan International Airport Kathmandu, meet our representative transfer to Hotel. Check in Hotel, get fresh and walking around the Thamel in the evening. Day 02Half day sightseeing in Kathmandu city, meet with Climbing guide Today after Breakfast Guided city tour of Pashupatinath Hindu Temple and Baudhanath a Buddhist the biggest monument in the world. Both of these are enlisted under world heritage sites. After sight seeing meet your climbing guide and check your gears. In the evening we invite you welcome dinner at typical Nepalese restaurant. Day 04Trek to Namche Bazaar (3440m. )5/6hrs.Lodge AccommodationYour guide will fix the tentative time to leave the tea house. Today you trek to Namche around 800 m you have to ascend from Phakding. The trail today passes through the rice field,pine trees and local sherpas' villages. At Monjo after checking your permits your trekking continues up to Hillary bridge that is easy part. After the Hillary bridge the trail is steep up to Namche. Somehow on the half way of uphill to Namche you can see the tiny top of Mt Everest which will give some inspiration to keep on walking. Arrive Namche stay at lodge..
Day 07Trek to Dingboche (4430m. )5/6 hrs.Lodge AccommodationAs usual after breakfast, you trek today to Dingboche which is 350 m ascending from Tengboche. 5/6 hrs hiking bring you to the camp at Dingboche. The first town from Tengboche is called Pangboche which is another oldest town in the Everest region. The trail today is mostly semi flat and some uphill. From Pangboche the trail up to Orse is semi flat then as you are close to Dingboche it is uphill for 45 minutes. Dingboche is warmer and less windy compare to Pheriche. Day 13Trek to Island Peak high camp 5087m 3-4 hrs. Camping After trekking for 3-4 hrs from Chhukung arrives to Island peak base camp. Island peak base camp is 5087 m which is lower than Gorakshep so our intention is to let you sleep well before climbing the Island peak. Good sleep is very important for energy restoration. 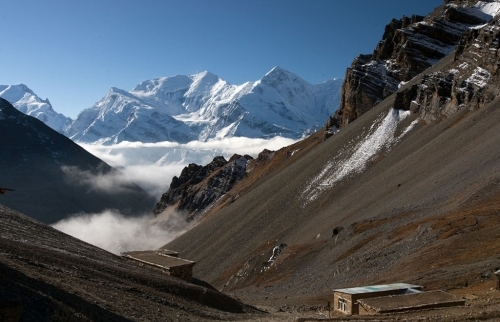 Somebody go to high camp 5600 m which makes climbing shorter but the question is good sleep. As you arrive to base camp it is mid day and your climbing guide will provide you basic lesson of climbing, setting the rope in base camp.You have to stay at tent and chef prepared food is served during your climbing. As you have to start early in the morning better go to sleep earlier. Day 14Summit Island peak then return to Island Peak base camp/Chukung.Camping/ Lodge AccommodationToday around 2-3 am ( according your climbing guide given time) you leave your camp for Island peak climbing.The journey begins to 6189 m. Our support team along with climbing guide will help you to carry your equipment and hot drinks up to Crampon Zone, little bit higher from the high camp. Where from the snow starts. Good luck ..And upon your successful climbing you climb down to base camp. Our support team will come to meet you at high camp with the hot drinks and snacks. And you will decide whether to stay at base camp or walk 3 hrs further to Chhukung according to your situation. Although you stay at Island peak Base camp you can walk down to Namche though it is longer day. Day 15Trek to Namche Bazaar. 5/6 hrs.Lodge AccommodationIf you stayed at Island peak base camp since you were too tired or arrived to base camp late, you have to walk 7/8 hrs to Namche. or if you walk same day to Chhukung after climbing Island peak it is easy day to Namche bazar. Day 16Trek to Lukla (2840m.) 6/7 hrs.Lodge AccommodationWalk all the way down to Lukla for 6/7 hrs. Make a wish for good weather..
Day 17Flight back to Kathmandu. Hotel (evening farewell dinner in Kathmandu)Say Good bye to your support team and to your adventure journey over the Island peak and Everest base camp..arrive airport transfer to hotel. Relaxing day with the bathtub or hot shower in 2 weeks. So nice..
Day 18Reserve day in Kathmandu any case of bad weather in LuklaThis is buffer time for in case of bad weather flight cancellation before or after your trip. If everything goes smooth you can use the day as a shopping day in Kathmandu. Farewell dinner in the Evening. Day 19Trip end. Transfer to airportThe Trip ends. Bring a lot of good memories with the tired physics but the high spirit. Transfer to Airport.. Good bye to our dear friends..